I have made it my mission this year to visit as many countries in Asia as possible whilst living in Singapore for a short time. My first visit to Malaysia was Kuala Lumpur. I was seriously impressed. and knew I definitely wanted to see more of this beautiful country. 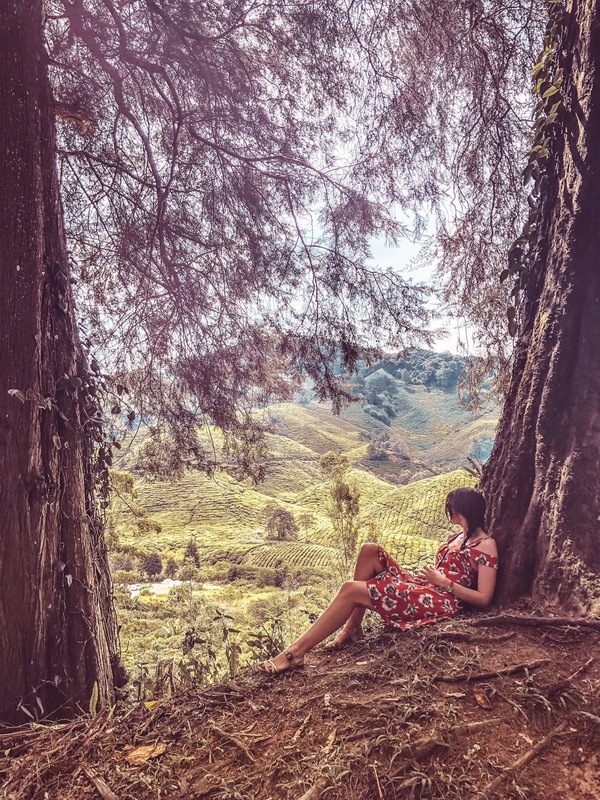 I had hardly seen the Cameron Highlands mentioned on any travel guides but locals had advised us that it was a really unique place to visit so I was very happy when my partner suggested he would research it, book it all and I could just turn up! If you are trying to stick to a tight budget, I'd highly recommend the overnight bus from Singapore to Cameron Highlands. Not only is this cheaper than flying, it is also more convenient. This is because the airport you would fly into (Ipoh) is actually a good 3+ hours drive from the Cameron Highlands region. Our bus ride (one-way) came to just under S$50 per person: you can book your journey here. We got on the bus at 10.30pm on a Thursday evening near Lavender MRT and the boarding process was seamless. The time of arrival can vary but traffic was on our side so we arrived before 8.00am the next morning. The seats on the bus fully recline and you get generous leg room. We stopped twice for passport control: once when exiting Singapore and again when entering Malaysia. When entering Malaysia you will be required to take anything you have on board the bus with you inside the border control office to be scanned, just like you would in an airport. Make sure you take plenty of food and water with you as it's not guaranteed when the bus will stop. I was also absolutely freezing as the air conditioning was set to arctic temperatures so I'd highly recommend taking layers, socks and blankets! Alternatively you can fly directly from Singapore to Ipoh airport via Scoot. The cost can vary but hover around the S$200 mark per person, for a return. We actually flew back on the Sunday evening but I would have happily got the bus back as it was much easier than I expected. Just don't forget if you fly to add on the cost of a taxi or bus to get you from the Cameron Highlands to the airport. Our taxi was 300 Ringgit (approx £60) and booked through the hotel, but I think this may be available cheaper if you book more in advance. I'd recommend two hotels which are both in a very similar location and equally stunning. We stayed at the amazing Cameron Highlands Resort - click here to read my full detailed review of this hotel. Another option I would strongly recommend is The Smokehouse hotel. which has the most beautiful, colourful country garden. I felt like I was in the UK but with beautiful sunny weather. Either of these options makes an ideal base to explore your surroundings. What I liked most about our hotel's location was its proximity to the evening market which is really interesting to walk around and has some nice street food. I found the evening entertainment and food options to be limited in the Cameron Highlands, as well as taxis not always easy to just flag down, so I really appreciated being able to do this. We had a fairly busy weekend in the Cameron Highlands over our 3 day stay. The first day was spent relaxing at the hotel and was perfect after the overnight bus journey - read more about what we did here. Let's just say it involved eating and relaxing - my two favourite things! We loved the hotel so much and did so many nice things there I had to split this into two posts to do everything justice. As we had spent all day relaxing we decided to venture out to the night market that evening. We have been to a number of these now around Asia and really enjoyed this one. One of the best things about this region is the amazing fresh produce grown due to the cool, non-humid climate and you could really see this at the night market. There were many vibrant fruit and vegetable stalls and I just wished we could carry some back to Singapore. Most stalls also had some kind of strawberry produce: from fresh strawberries to strawberry sweets, milkshakes, chocolates, anything strawberry related! There were stalls selling hot Malaysian food and we sampled some lamb and chicken which were both nice. For dinner we decided to venture into the central town of Tanah Rata and dined at a restaurant called Singh Chapati Urban Restaurant. This was slightly hidden up a lane so I would advise booking a taxi to take you directly there. We had a beautiful Indian meal: paneer makhani, chicken masala, rice and garlic pratha. The entire bill came to only 38 Ringgit (approx £7 for two people!) This included bottles of water only as the restaurant doesn't serve alcohol. There were other restaurants in the town with many Malaysian and Indian options and we saw some pubs so there are places to go for a drink. We decided to hire a taxi driver for the day which we organised through our hotel. Attractions are quite spread out and drivers can be hired for as little as 25 Ringgit per hour, so we chose to have a lie in then book a driver for the afternoon for a 5 hour slot. I would advise possibly booking this as soon as you check in your hotel as it can get quite busy, especially on a weekend. We asked reception to book this for us and they were very helpful but there was a wait as taxis were so busy that day. The main activity which I would recommend to any visitor is the 'Sungai Palas' tea plantation by the biggest tea company in Malaysia, BOH tea. It was absolutely stunning and photos don't even do it justice. 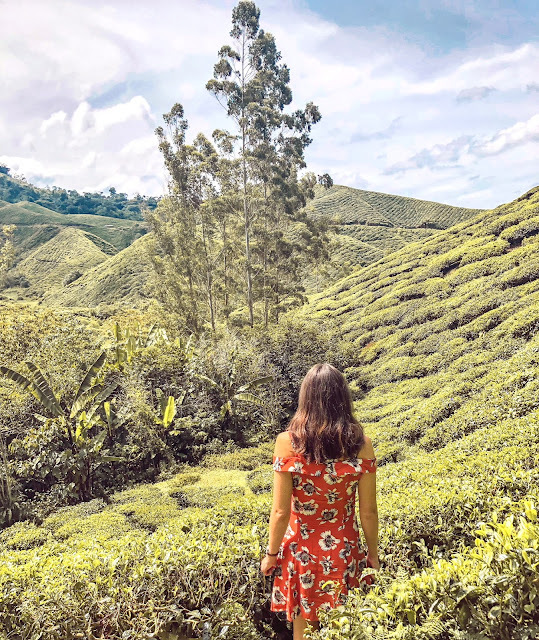 I had wanted to visit a tea plantation for so long and this was a great bucket list tick! We had a lovely relaxing walk around the unique tea fields, followed by the most beautiful scones, cakes and of course BOH tea in their on-site cafe. It is open 9.00am - 4.30pm every day except Mondays. The cafe has gorgeous views overlooking the tea plantations. There is also a small information centre which explains the whole tea leaf process from start to finish and you are able to walk through the factory to see the process first-hand. Next up, we wanted to see the lavender fields and try some unusual-sounding lavender ice cream so we decided to visit Cameron Lavender Garden. It is on the way back from the tea plantation so can be easily slotted into a day trip if you hire a driver like we did. I found the place a little disappointing; it was essentially a greenhouse with some lavender plants as well as other quite basic plants. There was also strawberry picking available so this is a good place to do that if you don't get another chance. We chose to wait to do this on day 3 as there were many strawberry picking places near our hotel. The lavender ice cream was quite nice but it's definitely not for everyone! I think unless you are desperate to try this and see the lavender I'd probably skip this part with hindsight and spend longer walking round the beautiful tea plantation. 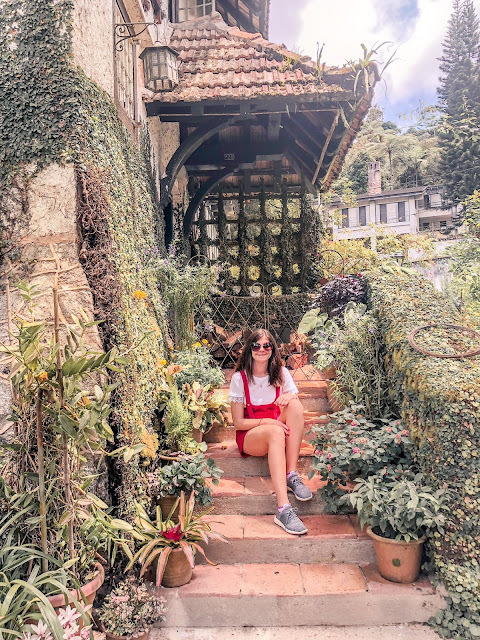 Other activities in the area include a butterfly farm, which looked great for children and was also closely located to the tea plantation and lavender garden. Please be warned that the traffic is very slow and busy over there, it took us hours to get back to our hotel which really wasn't very far away so you may not fit too much into one day. I think this is due to the way the roads have been set up on the way up to the tea: they are really narrow and people don't seem to be able to move very quickly! For dinner we decided to stay in our hotel and tried their Gonbei restaurant: read more here in my full review of the Cameron Highlands Resort. On our last day we decided to explore the local area and went on a walking trail recommended by our hotel. The surroundings were so beautiful and reminded me of an English woodland. I'm so glad we decided to venture out for a walk as I really welcomed that fresh air after the humidity of Singapore. 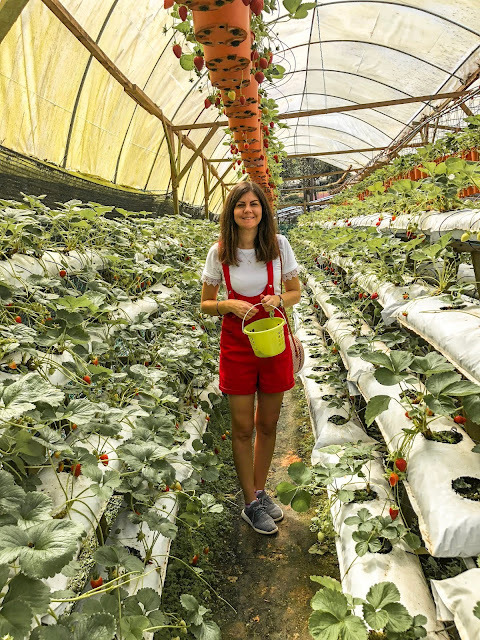 We have been missing nice strawberries whilst living abroad so we were excited to do some strawberry picking whilst in the Cameron Highlands. There are countless places to do this but we chose Abang Strawberry which was great and had plenty of delicious, ripe fruit for us to pick and was so inexpensive even though we were greedy and collected a huge bucket. They also have a cafe with a strawberry themed nasi lemak (a traditional Malaysian dish) as well as fresh strawberry milkshakes but unfortunately it was too busy for us to try. 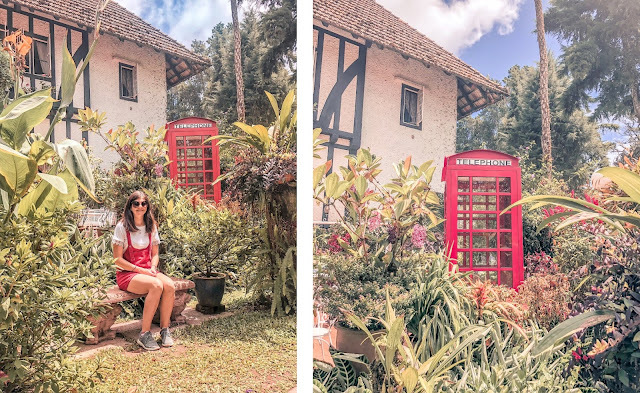 After we finished our walk and strawberry picking we headed to the beautiful, old-fashioned Smokehouse hotel which has a totally British countryside feel to it. We had lunch here and found it to be very similar to a hearty pub meal back home in the UK. I had a chicken pie, mash and perfect gravy: whilst my other half sampled the fish and chips. Safe to say his first cod fish and chips for six months went down a treat! The whole place is stunning; you can either sit in the most gorgeous country garden or inside with a traditional log fire and very old-fashioned British pub aesthetics. They even have a red phone box in the garden! Whilst a taste of the UK in Asia might not be for everyone we certainly enjoyed this meal. I loved this weekend, it was really different from anywhere else I have seen in Asia and I will never forget it. This is highly recommended as a weekend break for those living in the region! If you are interested in other weekend breaks in Malaysia, read my 48 hour guide to Kuala Lumpur here.